This book is an account of the Falklands War prepared from the accounts of those (both British and Argentine) who took part in the war. Often referred to as a forgotten war, the Falklands conflict was the first war of the modern age, using satellite surveillance, night observation devices, and all the very latest weaponry military technology had to offer. It was also the first real media war—the public's perception of this far-off conflict mediated by what they saw on their television screens and read in their newspapers. Drawing upon the vast resources of the Imperial War Museum's Sound Archive, and containing previously unpublished material, this work presents the first complete oral history of the Falklands War. From the initial invasion of the islands to the British landings to the Argentinean surrender and its aftermath, the book is a unique and essential chronicle of the conflict from all sides and perspectives, told in the participants' own voices. Overcoming the difficulties of conducting a war at the most enormous distance from home and during the Antarctic winter, British troops successfully landed on the Falklands; the Argentine response led to growing casualties on both sides. At sea, losses included HMS Sheffield and Coventry and the Argentinian cruiser General Belgrano. Facing extreme conditions, British troops fought their way across demanding territory to retake the Falkland Islands. This is a record of the defeat of the Argentines in a series of engagements the names of which have become legendary - Goose Green, Two Sisters, Mount Tumbledown - and ends with the liberation of Port Stanley itself. 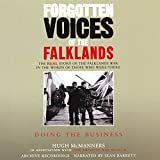 Drawing upon the vast resources of the Imperial War Museum's Sound Archive, Forgotten Voices of the Falklands presents the first complete oral history of the Falklands War. This audiobook is a unique and essential chronicle of the conflict from all sides and perspectives, told in the participants' own voices.